ROCK and RUN on June 19! That’s our vision, but we need help to make the vision a reality! We’re set to release our album for preschool children before the end of the year (the songs–written and performed by some of the country’s best artists like Barbie Almalbis, Julianne, The Dawn, Rivermaya, Itchyworms, Coffeebreak Island, Brigada, Lougee Basabas, DJ Benjo Marquez, Salamin, Joey Ayala, Cynthia Alexander, and a lot more–have already been tested in classrooms and are ready to be produced), but in order to do that, we need to raise the finances that are required to produce the albums and the manuals. Thanks to our friends from JCI Manila, CANON, BROOKS, CROCS, and RED BULL (and more), we have a chance to reach our goal. ROCK and RUN is happening on June 19, Saturday, 5 pm onwards at the Bonifacio Global City, and it’s a one-of-a-kind run that will feature live bands like The Dawn, Kjwan, Taken By Cars, Brigada, Coffeebreak Island, and more, performing along the race route. How fun is that?! If you’ve read all the way to the end, THANK YOU! And please feel free to invite your friends to run too! How to Love Your Life: Listen to some good music AND support a good cause while you’re at it! I know I said I’d blog about the recent RepubLIKHA Children’s Music Fest, but I’m excitied about this event that we have coming up, so this couldn’t wait. I’d like to invite you (yes, YOU!) to come to a fundraising event for our non-profit org, REPUBLIKHA, which is being produced by the awesome people from Light It Up Productions. Not only will you get to enjoy a one-of-a-kind gig (you’ll get to watch some of the country’s coolest artists playing their hits AND some children’s songs too), but you’ll also make a contribution to our efforts to bring good quality, educational music to Filipino children. Find out more about RepubLIKHA at www.republikha.org. As I mentioned in my last post, I decided to take on Mariel‘s 30-Day Blog Challenge. My problem is that I wanted to start blogging about A LOT of different stuff that I didn’t know where to start! So I decided to ruthlessly make some edits and save the rest for the other days. So now I’m down to two things that I wanted to blog about, mainly because these two events made me happy this week. 2. The RepubLIKHA team went to the Gawad Kalinga-Poveda site again yesterday. It was great to be back! This time around, we taught the preschool kids about Tempo. The kids are awesome and the session was lots of fun. After 2 hours with them, we stayed to have lunch with their parents to get to know more about their community and their needs as parents, especially when it comes to educating their children. Carisse, teaching the kids the Watermelon song! These two events got me thinking about how grateful I am to have the opportunities to be around kids and teenagers. They make me smile and laugh, and they keep me on my toes! Being around them allows me to learn and exercise patience, loving-kindness, compassion, humility and a whole lot more–like the latest trends, YouTube discoveries, and even corny funny jokes, among others! But seriously, if you take time to listen to them–whether they have problems or they just want to tell you about a new toy or gadget–you’ll surely be a blessing. Some of them just need someone in their lives who will listen. Here’s MY challenge to you today: find someone younger than you and strike up a conversation. Be a blessing…and you’ll be surprised that you just might walk away feeling more blessed! Would you like to help us by making a donation? Big or small…we’ll welcome all! Hi everyone! On July 31 (that’s this Friday! ), Republikha (our NGO–find out more about us @ http://www.republikha.org) will making another visit to our first beneficiary at GK-Poveda (their community is in Taguig City). In the morning we will be teaching the kids (preschoolers!) about music. After that we will be sitting down with some of the parents and guardians of GK-Poveda so that we can get to know them better. We also want to find out what their challenges are in terms of education and dealing with the messages that media sends today. Would you like to help us make this day more special? We are collecting donations (in cash or kind). If you own a music store, musical instruments will also be a blessing to this community. These instruments can be 2nd hand or brand new. We are looking at: tambourines, xylophone, maracas, or a guitar. Please let us know if you are willing to help out. If you are in the Makati-Ortigas- QC area, we can pick up your donations. If you’d like to help out, leave a comment here or send me a personal message! REPUBLIKHA: Get to know us! 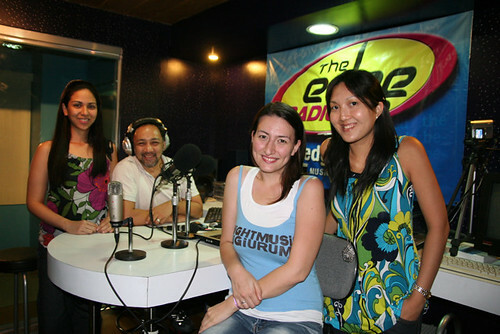 April 17, 2009 – Carisse and I guested on The Edge to talk about our non-profit organization, RepubLIKHA. If you have time, watch this video and support us by being a RepubLIKHA fan on Facebook! Please please go and find a paper a read it! I’ll post the bigger versions tomorrow, I just want you to go and see the real thing first. Haha! THANK YOU to TEAM SUPREME and GINO DE LA PAZ (you are instrumental! ), JC VALENCIA for the photos (thank you so so so very much), RED LOGO for the shirts, and Rivermaya, Salamin, Julianne, Barbie Almalbis, Gloc9, Joey Ayala, Brigada, Coffeebreak Island, Bituin Escalante, Peryodiko, Itchyworms, Radioactive Sago Project, Cynthia Alexander, Michael V, DJ Benjo Marquez, and all the other awesome artists who are going to be part of our first project/album (more names to be announced in the coming weeks)! It doesn’t stop! We want to thank Ron and Owie of THE EDGE radio, too, for having us over as guests last night. These are awesome people. Kwela. Masaya. Makulit. Smart. Wise. Talented. I’m eager to get to know them more. :-) We’ve got weekly training sessions with them for the rest of this month, so do keep praying for us! Thank you to Alex and Ben Compton for opening that door and introducing us to Young Focus and thank you to the dedicated and inspiring Young Focus team (Sir Ronnel, Kuya Manuel, Grace, Mark, Tina). 2) I had a good meeting with the Young Focus team at their student center in Tondo (I didn’t get lost on my way there either! Woohoo!). Young Focus aids the children and teenagers from the Smokey Mountain 2 area (for more info, check out http://www.youngfocus.org). They’re doing such a great job. I’m conducting several programs for them next month and I’m really looking forward to that. I can’t wait to meet the students! 4) I graduated from the Every Nation Leadership Institute (Year 1). I love my classmates and I love our church! It was just so cool how they made us all feel special. Special shoutout to Pastor Dennis Isleta! He was such a good “daddy” to our class, and we appreciate him a LOT. Another special shoutout to Ramir Mallari for putting up with us and managing to get us organized, because our class can get pretty rowdy. Haha. 5) We had a great afternoon with “supersiblings” Lea and Gerard Salonga last Wednesday. They’re really nice and down-to-earth, and I’m glad that they’re excited about our project. Awesome stuff up ahead! 6) I managed to have time to eat dinner at Taco Bell (one of my favorite eateries!) AND watch John Legend with two of my best friends, Camille and Carisse. John Legend was definitely in my must-see concert list (I’m still praying to be able to watch U2, Tony Bennett, John Mayer, and Coldplay in my lifetime! ), so I’m glad we got to watch the concert. It was fun! From time to time, I’ll be featuring some people who I think are pretty awesome. I’m calling it the SUPERHERO SERIES! Do you know how valuable one little step can be? I look at my 9-month nephew who fearlessly attempts to take a step every time we prop him up. I know without a doubt that one day, during one of his fearless attempts, he’ll finally find himself walking. Oh, what one little step can do. 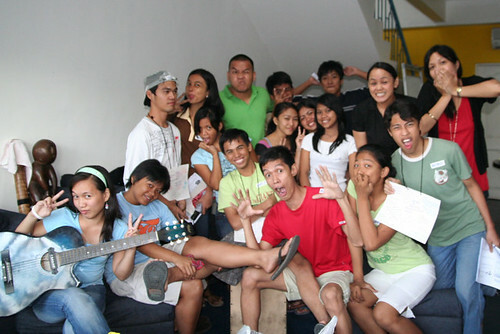 One little step turned Gang Badoy’s vision into something bigger, that which is now known today as ROCK ED PHILIPPINES. I am not entirely sure how Gang started Rock Ed, but at present, it is one of the most prolific and most talked-about non-government and non-profit organizations in the country. To find out more about Rock Ed Philippines, go to http://www.rockedphilippines.org. Gang is one of the most passionate and most energetic women I know. I had the pleasure of working closely with her and Rock Ed in 2006 to 2007 when we launched ROCKERPARK, a campaign to collect brand new, used, or previously owned sports equipment for public schools under the RockEd P.E. Project (by the way, Rockerpark returns after a 2 year hiatus tomorrow/Saturday/Feb28!). Gang is always on the go! She has tons of great ideas, she has the drive to see them through, and in addition to all that, she knows how to mobilize young people and she uses one of the most effective tools out there: music. Being around Gang is like being around a hurricane—but I mean that in the best way possible! :-) She moves, and she moves fast! I really admire that, because I am person who tends to be very cautious, but Gang is a classic example of how taking steps–no matter how small they are–will really make a difference in society. A few years ago, my friend Carisse had a vision. A former pre-school teacher, Carisse was perpetually frustrated with what kids were learning from the media. She would see kids sing the songs they heard from noontime shows–mostly novelty songs that we all know have little to no substance. I’m so excited for our first project! Later this year, we’re targeting the release of a full-length children’s music album that we’re calling JOOMA JAM! The album (which will come with a Parent and Teacher Manual) will feature original English AND Filipino music from over 20 of the Philippines’ most popular and critically-acclaimed artists and bands who have signed up to support this vision. To find out more about RepubLIKHA and JOOMA JAM!, log on to http://www.republikha.org.